AVON typically comes out with fun themed nail art design strips every holiday (see Halloween and Christmas, for example) so I was excited to try out these spring-inspired designs that can also be worn on more than just one occasion. Floral Fever features an explosion of flowers while Sun Worshipper reminds me of (pretty) fish scales. As always, the strips were easy to use though I did experience a little bit of crinkling with the Sun Worshipper design. I think this is because it's slightly thicker, which makes it hard to get smooth, but didn't end up being that noticeable once my entire mani was done. These limited edition designs are currently on sale so get them before they're all gone! Beautiful designs! So perfect for spring! These are so cute! I never would have though of pairing these patterns together but I love the look. So pretty! 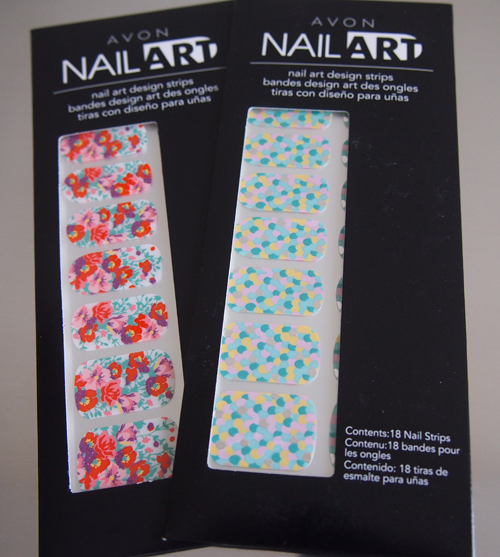 On the package, I actually liked the floral more, but when I saw it on your nails, I changed my mind. The "scales" one is so much prettier and easier to distinguish the individual shapes and shades! Me too! I really like the mirrored parts. Alison I loovveeee these designs! So freaking cute and perfect for Spring and Summer! Oh I loooove how you mixed the two styles in your mani! !